The magic of glass, originally made to imitate gemstones, continues from ancient times to today. Natural minerals and elements are heated to high temperatures and transformed magically in furnace, kiln, by handheld flame. The combining of different glass elements is "fusing". A popular metallic component is "dichroic glass". We show below jewelry pieces and other forms of art from various designers that are fused glass, and many of them include shimmering metallic dichroics! If we have more work by any designer shown, you can find it by using the jewelers list to left, or by clicking on the product name for enlarged image, and using the click here link to full artist page. Fused glass cross pendant measures 1-3/8 x 7/8 inches. Made by Laurie Mellenbruch, it has black glass background with dichroic corrugated shapes fused on in vibrant golden-green colors, hint of blue. Small ring on top that you can suspend from your own chain. Sylvie Lansdowne of Georgia is reknowned for her lampworked glass sculpture and intricate beadwork. This extraordinary collectibel piece features a glass mermaid suspended on sterling wire, smaller glass beads dangling below. 6 inches long overall with ring at the top, it could be a pendant, lamp-pull, or just a most beautiful object to enjoy. Mermaid has tailfin that is 1-1/2 inch across, glass colors in the entire piece include cobalt and turquoise blue, green, body pink, lavender. 5/8 inch square of fused glass, transparent and dichroic, sparkles in bright sapphire blue, turquoise and mint. 1-3/8 inches long on surgical earwire. 5/8 inch square of fused glass, dichroic, sparkles in bright rose pink and gold within black pattern. Surgical steel post at center. Glass frame approximately 6x8 inches, fits 5x7 photo under clear glass at center. Mounted on fixed metal stand for vertical viewing only. Colorful wire and beaded accents at top. The glass colors include lavender, amethyst purple, rose, turquoise blue. Clay plaque embossed with metallic bronze has words TRULY MADLY DEEPLY. Dichroic and transparent glass pieces in freeform organic shapes, the colors are metallic turquoise green and purple, aqua blue. Skinny pieces dangle from surgical post under round top, for 2-1/2 inch length. 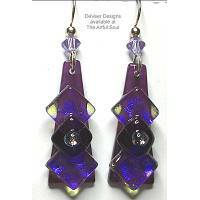 Fused dichroic glass earrings, black background with center panel of dichroic orchid purple. 1-1/2 inches long on earwire, 3/8 inch across. Made by Megg Isaac of Snapdragon in North Carolina. Petite pendant of fused glass in dark blues is about 7/16 x 9/16 inch plus bail, set in sterling silver. Mark and Kelly Payne, designing jewelry under the name Indigo Flameworks, have a true artistic partnership. Kelly cuts dichroic and colored glass, fusing them, painting with enamels (which are glass ground into fine sand), fusing and layering into a final stone. Mark cuts and polishes these with lapidary tools, and creates the sterling body to finish the piece of jewelry. The depth and color variety of these pieces is more than can be seen in web images! Here is a selection of a small plain bezel pendant. For comparison, #B is in shades of red, purple, black and gold measures 5/8 inches across bottom, 3/4 tall plus bail. A medium-sized pendant. For comparison, #B has a wonderful pastel pallette with peach, aqua, pink and gold. 3/4 wide x 1-1/4 including bail. Fused glass pins, individually made by Karen Ambellan. They feature black glass backdrop with metallic dichroic glass shapes fused onto the top. A choice of shapes and colors, with smallest #C at center measuring 1-1/8 inches. All have barpin closures to be worn at the angle shown. Fused glass pieces rich with dichroic metallics covering the entire top surface. The center is violet, surrounded by teal blue squares, with vivid fuchsia purple background. Set in sterling silver, designed by Michele Foster of Libertad! Bracelet is 1 inch wide at center, graduated sizes of bezel cup-set glass are joined by dual rings so it will not twist, covered in back. 7 inches long when clasped. The clasp is a secure hook and foldover style. Bernard-Sokoloff freeform shape of fused glass, has a black background and splashed of metallic dichroics in lime, gold, turquoise, royal and fuchsia. 2-1/4 inches with horizontal barpin clasp to wear in direction shown. 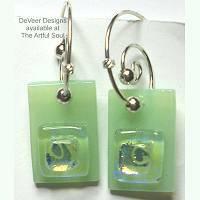 A pair of square and round fused dichroic glass elements are dangled with final hematite bead to make a pendant 2-1/8 inches long including bail. 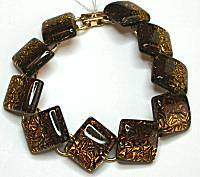 The rich colors are golden topaz and smoky brown with textured background that pops with gold-like shards from within. Comes on slender 16 inch black rubber cord with sliding clasp. Glass frame approximately 6x8 inches, fits 5x7 photo under clear glass at center. Mounted on fixed metal stand for vertical viewing only. Colorful wire and beaded accents at top. The glass colors include black, citrine yellow, purple with subtle pink script. Clay plaque embossed with metallic coppery bronze and blue has words ETERNITY. 1/2x5/8 inch rectangles of fused glass with dichroics, are joined onto goldtone metal link chain that gracefully wraps the wrist, closing at 8 inches long with foldover clasp. The elements have smoky brown and yellow topaz colors on each half, look into them to see a texture background that explodes like shards of sparkling gold. 1 inch long including surgical earwire, a single 1/4 inch fused glass element with dichroics does a big job with the sparkling colors in aqua blue and turquoise green. 2-1/8 x 3/4 inch fish is fused glass mosaic on black background. The bonefish motif has a single long body element with black bead eye and dangling tail. The sparkling dichroic colors include lemon-lime, gold, cobalt, purple, green. Attached silvertone bail, comes on 16 inch black rubber cord with non-metal clasp. 1-1/2 inches long on sterling earwire, 7/8 inch across. The turtles are fused glass mosaic mounted on black backing. The sparkling dichroic colors include bright green, dark fuchsia and blue. If you like the jewelry designs shown on this page, we think that you might also appreciate the work of these other designers...ready to try something new? 2 inches long on sterling earwire, 3/8 inch across. A trio of glass squares are layered and stacked atop the background column of glass, colors are plum, metallic violet and yellow, crystal accents. 1-1/4 inches long on sterling earwire, 1/2 inch across. The wire is curved into big spiral that finishes long in back of ear, captures dangling glass in its ornate front flourish. Rectangle of translucent celery green has a pair of gradually smaller squares fused onto the bottom in iridescent lavender/gold. 1-1/4 x 5/8 inches. Fused glass on black background, there is a mosaic of individual pieces from head to tail with black bead eye. 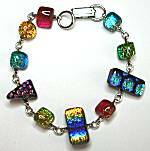 Sparkling dichroic colors include cobalt, pink, green, aqua and red. Attached silvertone bail, comes on 16 inch black rubber cord with non-metal clasp. 1-1/4 inches long on sterling earwire, 5/8 inch across. The square is fused dichroic on top of black background, the color is sparkling aqua/light sapphire blue combo. Joanie M earrings, 1-3/4 inches long on silverplated earwires, 9/16 inch across. The almond-shaped fused glass element has raised dot at the center for dimensional interest, the colors work upward from peacock teal, to golden brown, to salmon pink. Joanie M earrings, 1-3/4 inches long on silverplated earwires, 9/16 inch across. The almond-shaped fused glass element has raised dot at the center for dimensional interest, the colors work upward from sage green (almost gray) to copper then gold. Joanie M earrings, 2 inches long on silverplated earwires, 1 inch across. The diamond square of fused glass has raised dot at the center for dimensional interest, the colors work upward from deep gold to copper and sage green (almost gray). Joanie M earrings, 3/8 inch squares with surgical post in back. The fused glass colors work across from warm brown to an opalescent pink, VERY interesting like looking into a boulder opal. 7-3/4 inches long with elements ranging from 5/16 to 3/4 inch wide, all mounted onto silverplated link chain. The dichroic and glass colors are brightly multicolored with solids, stripes and patterns, including the colors red, orange, yellow, blue, aqua, lime and fuchsia. Foldover clasp. Joanie M earrings, 1-3/4 inches long on silverplated earwires, 9/16 inch across. The almond-shaped fused glass element has raised dot at the center for dimensional interest, the colors work upward from gray, to gold and golden brown, jet black. Joanie M earrings, 3/8 inch squares with surgical post in back. The fused glass colors work across from gold to gray to jet black. Joanie M earrings, 3/8 inch squares with surgical post in back. The fused glass colors work across from salmon pink to peacock teal. Joanie M earrings, 1-3/4 inches long on silverplated earwires, 9/16 inch across. The almond-shaped fused glass element has raised dot at the center for dimensional interest, the colors work upward from teal blue to golden brown to black. Joanie M earrings, 3/8 inch squares with surgical post in back. The fused glass colors work across from deep true green to black.